Hey all, Look what’s available now…. I wrote a blog for the Children’s Literature Network about how this book came out of an email from an editor who knew I write biography and that I’m an adoptive mom four times over. It was a labor of love, a way to make sure my young adults know that I want them to explore the world and pick and choose heroes who will speak to their own talents and interests. But it also speaks to children in kinship care like John Lennon. Kinship care is an informal adoption in which a child is raised by relatives. Marilyn Monroe was raised in guardianship after her birth mother became too ill to take care of her. Do Diddley was adopted and so was Nelson Mandela. I loved learning about the people whose stories are included in this book. And I hope it’s read by families united in adoption as well as folks out there who hope to learn more about adoption and being adopted. You may have to special order from your local Indie bookstore or you can order this from Amazon or Barnes and Noble. 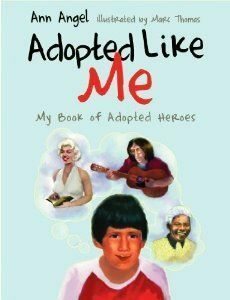 I thank you in advance for putting out the word that adopted kids turn into adopted heroes!